Homesickness is a recurring theme on Europe, the second album by UK indie-pop act Allo Darlin’. Named after a disastrous tour of Europe, which involved a near fatal gas fumes issue with their van, the album revolves around lead singer Elizabeth Morris’s reflections on her native Australia and the band’s life in London as they road trip unhappily across the continent. They clearly miss home, but where, many of the songs ask, exactly is home? Tallulah, with just Morris’s vocals and ukulele, is where these ideas come out most strongly, with Morris one minute reminiscing about a drive, with her friend in her “university car” in Australia, where the car door is so hot it burns their arms, and the next minute back on tour, in Berlin, writing postcards. 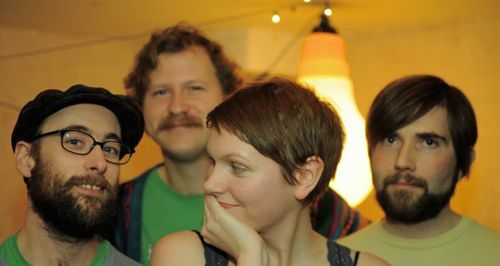 Another reason Tallulah, which has been a highlight of their live sets for a while and previously appeared on a 2010 Hangover Lounge’ EP, stands out is because it takes a welcome break from the band’s usual indiepop style. While this more up tempo style works well in places on the album, I just get the sense that I’ve heard this kind of jangly pop far too many times before over the last 30 years. The tricksy picking of guitarist Pail Rains and the driving rhythm section of bassist Bill Botting and drummer Michael Collins, plus Morris’s natural vocals, are what has attracted their small but dedicated following over the years. But I can’t help feeling it could be their undoing if they continue to stick with this tired old C86 style on future albums. Their peers such as London’s Tigercats or Brooklyn’s Hospitality have successfully breathed new life into the indiepop genre, but this is something Allo Darlin’ fail to do on the bulk of Europe. Morris’s vocals just seem to work so much better on the ballads, such as Tallulah and another highlight Some People Say. Her track I Know I Fucked Up on Darren Hayman’s 2011 January Songs project was another recent vocal triumph. But on Europe’s upbeat tracks such as Capricornia her style seems slightly out of place, not strong enough for pop, like a folk singer who has found herself in the wrong band as she struggles at times to squeeze all the words in. There are welcome flashes of where their sound may go, the violin on the album’s title track and slide guitar on Some People Say hint at a growing influence of US country and folk on the band, who are touring the US as this review is being written. I hope this is a path they continue to follow. Such moments bring to mind First Aid Kit’s country twanged album The Lion’s Roar of earlier this year, which was produced by Bright Eyes’ Mike Mogis. He would do an equally fine job on bringing out the country heart of Allo Darlin’. Allo Darlin’ are clearly still wedded to their indie-pop influences and Tallulah Ghosh tapes, but Europe, even with its flashes of brilliance, only offers the prospect of something as “amazing” as the day Morris sings about in Some People Say.